It’s your Friend / Partner or Family member’s birthday and you want to make it special. Despite all the arrangements to make it Amazing, you can Add a feather in a cap by playing a Happy Birthday Song with their own name. At 1Happybirthday.com, you can create a birthday song with an Indian name or any other name. Step by step guide to creating such a song is available in this post. At the top, you will see a search box. Enter any name here and click on the Search icon. Now you will see your name with a yellow background, click on it. Here you will get some options to Play/Download song. 1HappyBirthday Song Lyrics – I used GOLU for an example, it can be replaced with any name. 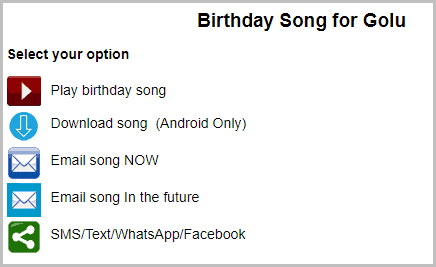 Currently, 1Happybirthday.com can create birthday songs of 43536 names. So there are very high chances that you will find a birthday song with your desired name whether its Indian name or other. Still, if you don’t find, just comment below and I will try to find birthday song for you! Keep visiting Hexcode for more nice stuff!